The New Jersey Devils managed a win on a trip to Boston with a 2-1 shootout W,but the price was a high one as David Clarkson is thought to have broken his ankle on a Zdeno Chara shot in the first period. 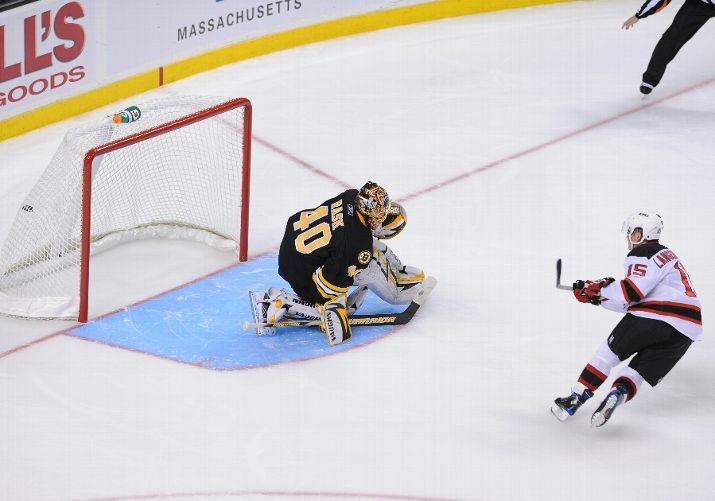 Zach Parise scored the only Devils goal in the game with a jam in behind Tuukka Rask in the second period (14),while Parise and Jamie Langenbrunner each beat Rask in the shootout. The Devils host the Islanders today at 1. 1) As if the Devils didn't have enough issues,the loss of David Clarkson would be huge. The Devils have only released that Clarkson's ankle "doesnt look good"but Fire and Ice has reported that the ankle is likely broken. 2) Zach Parise's shootout move was mind blowing,Tuukka Rask had no chance at all. I cannot wait for the Olympics and that should be the true coming out party for Parise. Those of us that get to watch him every night know the type of player that he is,but the the hockey world isn't giving him the recognition...YET. 3) Martin Brodeur was terrific in goal as was Tuukka Rask for the Bruins,but the defensive play was solid for both teams as well. Few penalties and fewer dumb errors. Brodeur set the NHL record for most minutes played when the third period began,but most importantly,Brodeur was "on",every time the Devils needed him,he stepped up in a big way. 4) Brian Rolston may be struggling on the stat sheet,but he is showing signs of a possible breakout. Seven shots yesterday and only a nice play by Dennis Wideman stopped him from an excellent breakaway chance. 5) Finally,big props to Andy Greene and Bryce Salvador,who are not only playing massive minutes,but doing well while doing it. Salvador blocked multiple shots in yesterday's game,showing the hustle that I love to see!! 6) Not sure how good a player Andrew Peters is,but he might be the Devils best heavyweight bomber in a long time. Peters hasn't fought a lot,but his demolition of Shawn Thornton shows why he doesn't have to! The Browns visit Cincinnati with the Bengals coming off a upset loss to the hapless Raiders in Oakland . Seattle travels to St.Louis,one of the few teams that they have defeated this season and the Rams are without starting passer Marc Bulger. Since I am writing this late and the college games are so spread out over the holiday weekend, the only Saturday game between teams in the top 25 is from the Mountain West as 19 BYU hosts 21 Utah. The NFL game features New England traveling to New Orleans on Monday night in a game that ESPN didn't figure to be a great catch when the season began. 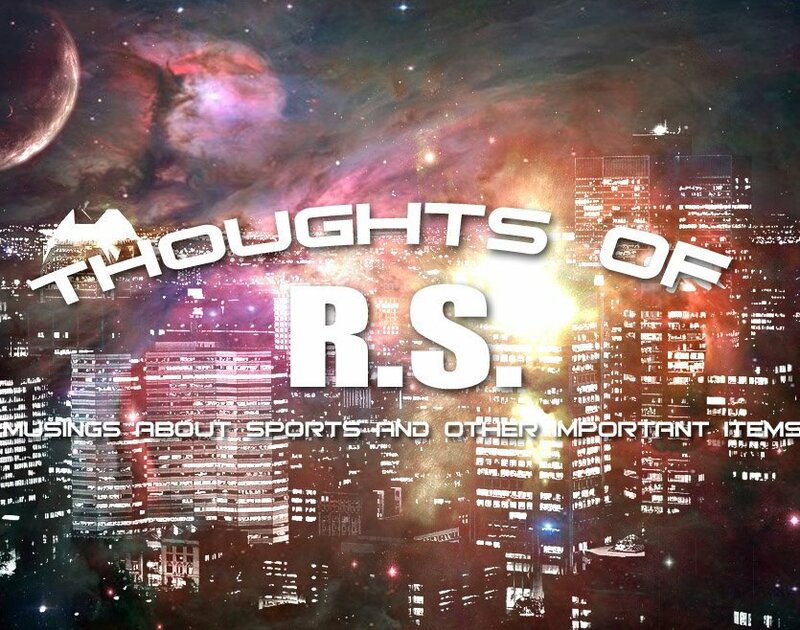 Happy Thanksgiving from your friends at ThoughtsofRS! 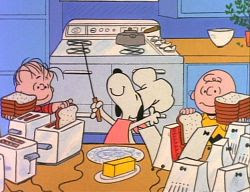 Enjoy the holiday weekend and two cool Thanksgiving videos as well!!!! The New Jersey Devils had picked up only one point in their last three games and needed to get things on track in the first of three games in four days. They were able to do just that in a 3-1 win over the Ottawa Senators at the Rock. Devils goals to Nicklas Bergfors in the first (6),the game winner to Patrik Elias in the second (1) and an empty netter to Jamie Langenbrunner (5). 1) The Devils caught a few breaks on both goals that eluded the new Ottawa netminder Brian Elliott. On Bergfors goal,Andy Greene was just dumping the puck into the boards,the puck took a fortuitous bounce to Bergfors on the opposite side of the net from Elliott. 2) The second Devil goal came off a Greene shot that Patrik Elias redirected by Elliott. 3) Patrik Elias has been playing a lot of center with the injuries to Dainius Zubrus and Rob Niedermayer and was expected to return to left wing when Niedermayer returns soon. Elias could stay at center longer,if the Devils continue to need pivots more than wingers. 4) Andrew Peters knocked two Senators from the game,although Alexandre Picard would later return. Peters renewed an old rivalry with Ottawa's Chris Neil by sending him from the game with what looked like a knee to knee connection and could have been called a penalty. Ottawa boss Terry Murray though it was a dirty hit and that Peters led with his knee. I can see his point,but I tend to believe it was more of Peters being a weak skater and smashing Neil rather than something dirty. Ryan says these two were always at each others throats when Peters was with Buffalo and they met eight times a year,so maybe past history had something to do with Murray's feelings. 5) Tim Sestito continues to see playing time as Rod Pelley has been a healthy scratch. When you consider that Pelley was talked about as the John Madden replacement during the off season,this indicates to me that someone (or ones) is unhappy with Pelley's play. Could Pelley and not Sestito be the player returning to Lowell when a center returns??? 6) At the games end as Jamie Langenbrunner prepared to dump the puck into the empty net,suddenly a stick flew by (later to be discovered as Daniel Alfredsson's) and missed the puck. Replays show that the official was pointing to the goal as a goal before the puck made it to the net. So,keep that in mind the next time a thrown stick deliberately appears on the ice! The melting pot starts with condolences to Chris Spielman and his family for the loss of their wife and mother Stefanie to breast cancer at the age of just 42. Mrs Spielman fought this insidous disease for 5 times over the last twelve years before it finally overwhelmed her. Our best wished to the Spielmans and the Buckeye family on their loss of their loved one. Make note of this because you wont hear this often. A very classy move by both teams. The Pirates added four players to the 40 man roster,none of them being a surprise. Gorkys Hernandez,Brad Lincoln,Bryan Morris and Ramon Aguero were added to the team after the Pirates claimed another pitcher from the Seattle organization in Chris Jakubauskas. Ironically,the Pirates made room for Jakubauskas by removing their last claim from the Mariners in pitcher Justin Thomas from the roster. Thomas along with Jeff Karstens and catcher Robinzon Diaz were designated for assignment. Thomas and Diaz must be traded in ten days or be released,while Karstens was placed on waivers. Mildly surprised on Diaz,not that he is Pudge Rodriguez or anything,but I figured the Bucs would get something for him anyway. The Devils return to action tonight against Ottawa and for the first time in ten days,I get to watch the game! New Jersey also plays on Friday and Saturday afternoons against the Bruins and Islanders. The Islander game is the first Devil home game over Thanksgiving weekend ever! That was a surprising point to me that the Devil front office sent here. Look for a guest writer sometime over the next few weeks,as I have lined up a post that should interest all of you Pittsburgh fans out there. 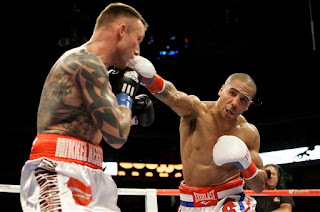 I was way off on the Mikkel Kessler-Andre Ward figh t Saturday night.The fight was stopped on cuts on Kessler from headbutts from Ward in the 11th round and Ward won the decision along with the WBA title. The contract that all the fighters in the Super Six tourney signed mandated neutral judges and referees,but the state of California would only sanction one of their referees and he did an awful job. Ward is the only fighter to have three "home" fights scheduled and the others fighters are talking about not fighting in California after this. Could it be that the tournament is on the verge of falling apart? The final show of the Ultimate Fighter airs tonight with a two hour finale that sets up the live final on December 5th. I have enjoyed the show more than I thought,although I will still take Boxing hand s down over MMA. I do have a favorite fighter now though in welterweight Josh Koscheck,a former NCAA wrestling champion. Koscheck won his bout on the last PPV with a submission win over Anthony Johnson. Koscheck is seems to not be very popular with MMA fans,I seem to pick guys like that. The loss by the Browns in Detroit was between two pretty terrible teams,but it produced arguably the most fun game that the league has produced this season. 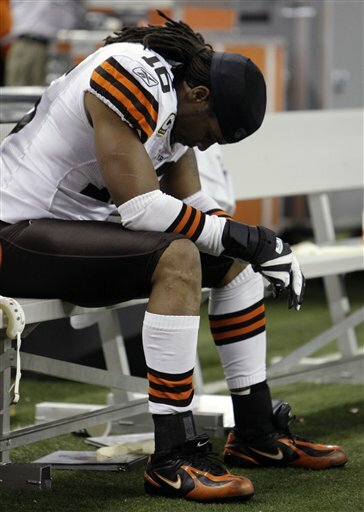 The heartbreaking 38-37 defeat was more entertaining than the Browns other nine games combined and that includes the only Cleveland win! 1) Granted it was the Lions,but I thought Brady Quinn looked pretty decent. Quinn was actually allowed to throw deep and his four touchdown passes could have easily been six if not for horrific drops by Mohammed Massaquoi and Chris Jennings. 2) Again,considering the opponent,the Browns were able to protect Quinn well for the most part and allowed just one sack. 3) Chansi Stuckey finally showed up as he caught a 40 yard touchdown pass and grabbed five of the six passes thrown his way. 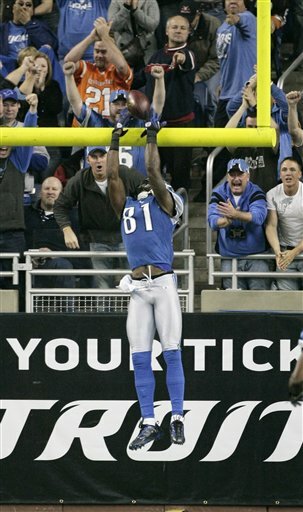 Stuckey was reported to have good hands and was a decent possession receiver when he arrived,but the Lions game was the first time that I saw that player. 4) Mohammed Massaquoi had his ups and downs with five catches,115 yards and a 59 yard touchdown catch. 5) Backup tight end Michael Gaines hard nosed effort on the touchdown that gave the Browns the lead in the fourth quarter was welcomed by me. 6) Who did Jerome Harrison tick off to see no action in favor of Chris Jennings? 7) You want to know what the biggest culprit was in this loss? Its a tie between the slow sludge running safety pair of Abram Elam and Brodney Pool(Give Pool credit for a interception though) that allowed Calvin Johnson to just have a free reign of terror all day. 8) The other member of the tie tandem? Good ol' Brian Daboll,who showed more moxie in the first half with his calls than he has all season and then stepped off the Lions throat with a 24-3 lead and then cleaned them up,tossed them a Pepsi and sent them on their way. Daboll's conservative calls allowed Detroit to rally in the first half and the Lions made an adjustment in their pass coverage in the second half that eliminated the Browns open receivers deep for most of the second half..
9) I know the linebackers are beat up,but with no one able to cover anyone,things were worse than the score indicates. Put the wide open Brandon Pettigrew game winner aside,Kevin Smith over 100 yards out of the backfield on four catches??? 10) For those of you that think Eric Mangini deserves the chance to pick his own guys in next years draft,make a note of this-Brian Robiskie,David Veikune and Coye Francies were all inactive for this game,the most winnable one on paper all season or least since the Buffalo game. Now either of these two statements HAVE to be correct and both are an indictment of Eric Mangini. Either all three of these players are so terrible that they cannot get on the field on a team this bad or they are in the proverbial doghouse and Mangini finds it more important to play veterans that are less talented and therefore not part of the future. That means either Mangini struggles in evaluating talent and picked poor players OR he i s such an out of control power freak that he isn't playing the best players. 11) More Mangini-These roundabout accusations about the Lions faking injuries to slow the Browns no huddle smack of sour grapes to me and what makes it worse occurs on two levels. One is that can he really think that even the lowly Lions need to fake injuries against this offense? That makes no sense to begin with,but the other thing is accusing his supposed 'friend' Jim Schwartz of doing so. Is there anyone that Mangini would not throw under the bus to deflect heat from himself? 12) Question of the day. I would wager that you will never see Eric Mangini as an NFL head coach again,but has he damaged his reputation so much as he might not ever be hired as an assistant again? 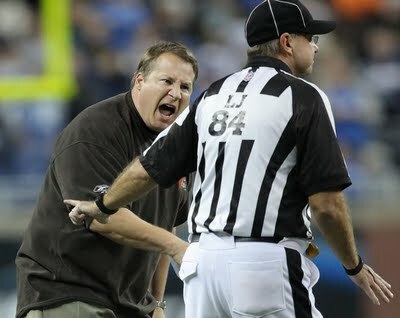 13) Onto the final play and I cannot believe that the Browns think that their was any controversy at all. Mangini tried to claim Matthew Stafford was out of the pocket,so Hank Poteat could shove his man out of bounds and that is true. BUT once the ball is in the air,he cannot do that and Poteat tackled his man as well as having his back turned to the ball. When a coverage player turns his back to the ball,the referee calls that pass interference everytime,a supposed wily (and I use that loosely) veteran like Poteat should know that! 14) As the play continues and C.J. Mosley smashes Matthew Stafford on the play (violating the Mosley rule that for him to make a play someone must trip over him) and seemingly knocks Stafford from the game. That sets the stage for creaky assed Daunte Culpepper to come in cold and win the game on one play,but Mangini starts calling timeouts and that allows Stafford to legally return to the game,sore wing and all. The reasoning was that Mangini wanted to make sure the Browns were in the right defense,but isn't that Rob Ryan's job? And further,shouldn't the Browns had plenty of time to plan this out as the Lions medical staff squeegeed Stafford off the turf? 15) See number nine as the main culprit on the scoring play as Jason Trusnik simply cannot stay in tandem with Brandon Pettigrew,even with Stafford's damaged shoulder,he still had time to drill the ball through a gaping hole for the game winner. Would David Veikune been able to bat the ball down? I kinda doubt it,but I sure like to think he would have had a better chance than the slow footed Trusnik. 16) Still scratching my head over the fake field goal call with seconds in the half. Phil Dawson completed the pass and then kicked the field goal on the next play. What was the intent on that,considering the time left in the half? It didnt cost the Browns any points,but it could have had Dawson's toss fell incomplete. There just was no reason for such a risk with such small upside. 17) Finally, despite the game being tremendously entertaining and fun for a change,I feel worse about the direction of the franchise. This was not only a winnable game against an awful team,coaching and poor talent evaluating are the glaring reasons for this loss. The Ohio State Buckeyes locked up an outright Big Ten title with a larger than it looks 21-10 win over michigan at the big outhouse in Ann Arbor. The title continues a five year title run (Outright and Shared titles) for Jim Tressel and OSU in the Big 10. 1) Terrelle Pryor's stats aren't overwhelming,but he continued to do what he has done since the Purdue loss-be a winning QB,use his feet at the right time and avoid the big mistake. 2) The running game has picked up too and continued its fine work with a total 251 yards on the ground. 3) The stars on this day were on the defense though. Two picks for Kurt Coleman, Brian Rolle and Ross Homan controlling the michigan backfield and Cameron Heyward delivering such a dominant performance that suddenly give me concerns about losing him early to the NFL. 4) The Buckeyes were given little respect by the voters for the All Big Ten team as the outright champs placed just two players on the first team in Justin Boren and Kurt Coleman. Only four players on the second team as defensive linemen Cameron Heyward and Thaddeus Gibson joined linebacker Ross Homan and running back Brandon Saine there. Two things stand out to me-Cameron Heyward should have been on the first team and linebacker Brian Rolle on the second team. 5) The sixth straight win is the longest run over OSU over michigan in school history and ties the second longest run in the series. 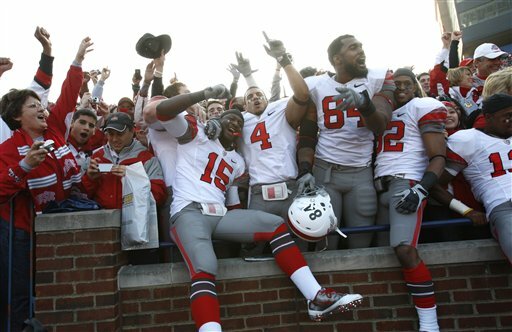 6) Ohio State wore what they described as the "tribute to the 1954 National Champions" uniforms in the game. They were OK,but the helmets were too much Penn State style for me. I wish they would have worn them in another game rather than the michigan game,but I am sure Nike paid a pretty penny to pick this one. Here is hoping that OSU sticks to the basics and resists the money and avoid being Oregon East or Nike's test mannequins. 7) Time for a few nuggets on the losers. Funny,I don't hear much from the ESPN Clowns (This is to you,Mark May) about michigan being BACK now after losing seven of their last eight games and the win was Delaware State. Those four wins only looked good at the time because Notre Dame was overrated as they are every year. 8) The combined record of the four teams in the four and zero start? Notre Dame (6-5) Western Michigan (5-7),Eastern Michigan (0-11) and Indiana (4-8). The media loves for the perennial powerhouses to do well and Ohio State is among that chosen bunch,but anyone that knew anything about knew that start was a mirage,although I did not think the wheels were going to fly off to the tune of 5-7. 9) As much as I am enjoying this dominance over michigan,I haven't forgotten how quickly things can turn in this series. Jim Tressel is 8-1 vs the team up north,but his predecessor John Cooper was just 2-10-1 and I remember just how bad the michigan fans are feeling right now. 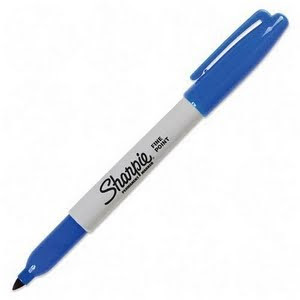 10) Finally,for those of you with a sense of humor. What would the score be in game of equal talent between a Rich Rodriguez coached michigan against Ohio State under John Cooper???? 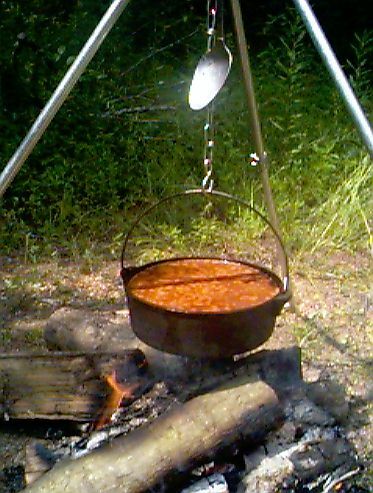 Hang in there,reviews of today's disaster in Detroit and the Ohio State win at the big outhouse are coming,but work has kept me away for a bit. The Devils dropped both of their road games to Nashville and Dallas,although the Devils did manage to earn a point in Nashville,so things were not all bad. New Jersey lost two more players on the swing though as Dainius Zubrus and Illka Pikkarainen each were added to the IR. Zubrus will be out for the next 4 to 6 weeks after injuring his right leg blocking a shot in Nashville,while Pikkarainen has an undisclosed illness. New Jersey now has six players that are on the injured crew and that includes 2 of their top four centers,their best two defensemen and their top penalty killing winger. The win streak that the Devils were on is going to be quite the buffer in piling up points as they may be harder to come by for a while with all of these injuries. Wish I could give more thoughts on the losses,but I missed both due to the CTZ starts. The Devils host Ottawa on Wednesday and coverage returns to normal..
Back tomorrow with football talk and plenty of it!!! Quick picks for this weekends games. Ohio State visits the big Outhouse and the game is only for braggin' rights for the Buckeyes. michigan needs to win to be bowl eligible. The Browns travel to michigan for a battle against the fellow 1-8 Lions. The one player on either team that stands out above all is Detroit wide receiver Calvin Johnson. Seattle attempts to upset Minnesota in the Metrodome. College game of week honors goes to the Pac 10 with what amounts to be a single elimination bout for the BCS bid. Oregon and Arizona hold their own destiny in their hands. Arizona's defense was ripped by Cal last week and will have to be far better against the explosive Ducks. The NFL game of the week goes to the battle for the AFC West lead between slumping Denver and charging San Diego. The WBA Super Middleweight title and the final bout of stage one of the Super Six occurs in Oakland tonight with champ Mikkel Kessler of Denmark battling hometown hero and former Olympic gold medalist Andre Ward. Ward has been relatively untested and now faces the top 168 pounder in the world as his first real test. Ward will have success early,but can he hurt Kessler? Joe Calzaghe is the only person to beat the Dane and even he didn't hurt Kessler. Some dips from the melting pot take over today as we clean up some ite ms that have built up. The Pontiac Silverdome did get sold and for a pittance. Well,more than I have to spend,but next to nothing for anyone with a decent supply of money. $583,000 dollars is all that it cost to own the Silverdome and while that is a huge amount of money for me,it is virtually nothing in the stadium business. The Hagerstown Suns couldn't completely renovate the Muni for that cost. The new Canadian owners are reportedly going to change the Silverdome to a soccer facility and hope to attract a MLS team to play there. The New Jersey Devils had both their overall winning and road winning streaks snapped on Monday with a 3-2 loss to Philadelphia. 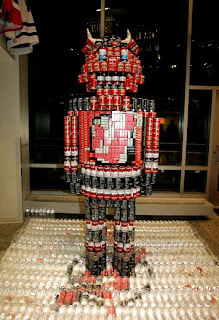 I missed the game,but In Lou We Trust reports the Devils were simply outplayed in the defeat. The Devils goals went to Zach Parise (11 with one second remaining) and David Clarkson (7 PP). The Devils go on the road for two games that I will see only parts of due to the later start times with visits to Nashville tonight and Dallas on Saturday. The Devils also made a surprising move in sending Cory Murphy down to Lowell and bringing up Tyler Eckford to replace him. This move along with bringing Matt Corrente up before the loss in Philadelphia,means that either Eckford or Corrente is guaranteed to make their NHL debut tonight in Nashville. Eckford was named the AHL player of the week last week with two goals and seven assists,but it is out of character for the Devils to have two similar young blueliners making their debuts at the same time. Sorry to hear that one of my all time favorites,Kareem Abdul-Jabbar,is battling leukemia. My dad was a huge A-J fan and I remember very little of my childhood that didn't have the master of the sky hook hanging on my bedroom poster wall. Was there any child of the 70's that didn't at least TRY the sky hook?? 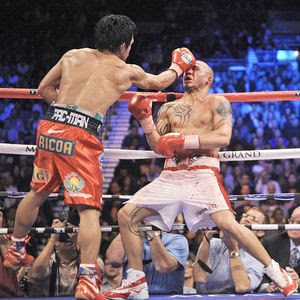 Manny Pacquiao stopped Miguel Cotto in the 12th of what was reported to be a dominant performance by Pacquaio,but Cotto was good enough to make th e fight entertaining. The drumbeats have already started for Pacquaio vs Floyd Mayweather,but I am skeptical that this bout will take place as Mayweather's track record shows that he only fights fighters far less skilled than him or fighters that are far smaller than him. HBO will televise a replay of the bout on Saturday. The Pirates released a slew of six year free agent players from their system. Only one name stood out in Jamie Romak. The Indians did the same and two names stood out. Scott Roehl was a pitcher that once held promise,but the most interestin g name was Josh Barfield. and was expected to be the Indian second baseman for years. Some struggles and the Indians apparent issues with working with talented young second basemen (Example: Brandon Phillips) ended that far sooner than expected. Could Barfield have a career Renaissance like Phillips after leaving the Indians? I would like to see the Pirates take a shot,if it works Barfield solves a problem and then the newly acquired Akinori Iwamura could be the rotating utility man and still get his at bats that way. Finally,the Browns placed Dave Zastadil and Steve Heiden on the injured reserve ended their seasons. Reggie Hodges punted against the Ravens,but I was unaware that Zastadil's season was in jeopardy. The Browns claimed two players off waivers to replace the IR players on the roster. 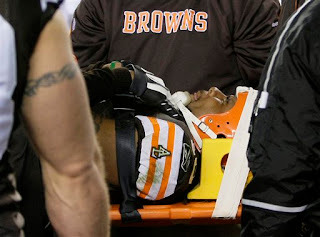 Wide Receiver Jake Allen joins the Browns from Green Bay and Arnold Harrison is a linebacker formerly of the Steelers. 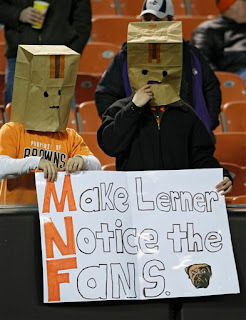 I have tried three times to write this post on the Browns 16-0 loss to the Ravens. I have said that often it is easier to write about bad things than good ones,but not this time as I just am struggling with this one. The Browns are so bad that we have passed the exit to bad and went straight to just feeling sorry for them. 1) I thought that Brady Quinn's "effort" or whatever it was that injured Terrell Suggs wasn't intentional,but it was poorly executed. 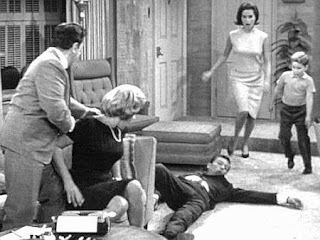 In any event,the fine that was slapped on Quinn seemed fair enough to me. It was ,after all,the first open man Quinn hit all night! 2) Far be it for me to call out a coach for pulling a "Steve Robinson",but Eric Mangini pulled a "Steve Robinson" in calling a timeo ut to make sure the Browns could run one more play in a lost game. 3) Watching the game,I was struck by the offenses similarities to the Bill Belichick Browns. Jamal Lewis up the middle twice (Or Eric Metcalf) and then a two yard swing pass by Brady Quinn (or Bernie Kosar). Brady Quinn is going to struggle no matter what,but let him open the toolbox and work a little bit. His arm cannot be that bad,can it???? The team never crosses midfield. 8) Wish I could give any to the offensive line,who protected Quinn not at all. 9) Rob Ryan tried his best to shock Baltimore by mixing blitzes and rushes from angles and for a half it worked. 10) The Browns are one of three teams at 1-8 (Detroit and Tampa Bay) and playing the Lions will not only shake that out a bit,but we will truly get a handle on just how the Browns have progressed. Sorry this is a bit late and short,but the work grindstone started on me shortly after returning. 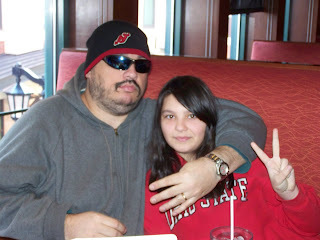 The Devils do play tonight in Philly against the Flyers,but the game is on Versus,so no TV here. The New Jersey Devils looked pretty awful for the first ten minutes of their home game against Washington. Two quick (and less than difficult) goals gave Washington the two goal lead and the win streak seemed to be dead. A funny thing happened though after that-the Devils erupted destroying the Capitals thereafter with five unanswered goals with some coming from unusual sources,dominating the final 50 minutes and earning a 5-2 win. Sorry not more,but time is short and I am just happy to get this one up! But the Buckeye defense ruled the day in the extra session causing losses on each of the Hawkeyes first three plays and forcing a bomb to the end zone to attempt to salvage anything. 1) The Buckeyes either knew Terrelle Pryor's physical condition was limited and wanted to protect him or the play calling was right out of the 1920's. 2) The OSU run game did do its job with over 200 rushing yards,Brandon Saine g oing over 100 alone and Boom Herron just missing the plateau,but I still didn't see the dominant performance from the offensive line that the numbers indicate. 3) Watching the game the first time,I was struck by just how biased Matt Millen was towards Iowa QB James Vandenberg,but watching the tape brought one thing to mind-Ohio State has now made two frosh passers look terrific in Vandenberg and USC's Matt Barkley. Could it be that the consistent defense of drop five,rush four is just the recipe to make a young signal caller comfortable?? 4) Under Jim Tressel,the tight end has always been more of an extra blocker,but the Buckeyes may have missed the boat with Jake Ballard. The huge tight end could have been a solid intermediate pass catcher and it seems to me that was a wasted opportunity. 6) Ohio State had several chances to put things away after gaining a 24-10 lead in the fourth quarter,but the big swing was the Hawkeye kickoff return for a TD. The Horseshoe was rocking after the Brandon Saine run,but you could feel the crowd and the Bucks lose momentum after that..
7) I like Jim Tressel a lot,but nothing concerns me more than his "Four Cornersesque" 3 runs and a punt stuff late in games. It is only slightly more exciting than this..
9) It had to kill Jim Tressel to watch what could have been the dagger to the heart on a interception return for a TD by Brian Rolle be called back for an offsides penalty. For a coach like Tressel that is all about mistake free football,that was one that would have dwelled for a long time had Iowa pulled this one out. 10) I was impressed with the dominance in the Iowa overtime possession by the OSU defense. 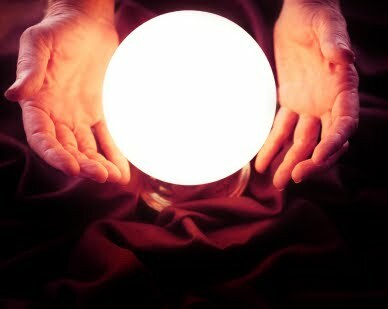 11) Here is hoping that michigan isn't looked past this week. Ohio State has clinched the BCS bid and a share of the title,but a win over michigan means the outright Big Ten title and no bowl (again) for the wolverines. That is plenty to play for in my opinion. Ohio State tackles Iowa in the Big Horseshoe with the Big 10 title on the line. The Buckeyes are coming off their best game of the season with their win over Penn State,while Iowa comes in off a loss to Northwestern and will be without starting QB Ricky Stanzi. Can Iowa score enough points without Stanzi against the best defense they have seen all season? The Seahawks travel to Arizona in a must win game for any playoff hopes. A win and they are in the hunt,a loss and it is all over. Seattle's three wins this season are over teams with a combined four wins and Arizona dusted them in Seattle in their first meeting. Our college game of the week goes to the Mountain West as 4th ranked TCU hosts 16th ranked Utah in the BCS bracket buster matchup. I am rooting for all three of TCU,Boise State and Cincinnati to win out,so the BCS can get even more negative press on what a dumb system they have. The NFL game of the week goes to the Patriots-Colts game. Tom Brady vs Peyton Manning,etc-You have heard it all before. 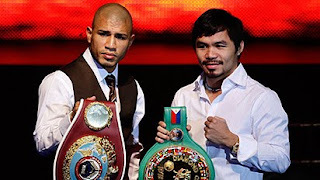 Manny Pacquaio vs Miguel Cotto in Las Vegas tonight. The key here is just how much damage Cotto still has from his brutal ( and possibly illegal) pounding in his loss to Antonio Margarito last year. IF Cotto has his former skills and power,this is a very winnable fight for him. Pacquaio's wins over a shot Oscar De La Hoya and a limited Ricky Hatton didn't do much for me and if you don't like that,then you have to go back for years for his split decision win over Juan Manuel Marquez (we thought Marquez deserved the nod) for a top notch win. 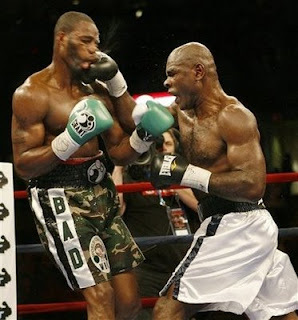 In case,this should be entertaining at minimum and I will go out on a limb and bet on the Cotto of old to appear. The New Jersey Devils fell behind a struggling Pittsburgh team early,but then sped by the Penguins with four unanswered goals to earn a 4-1 win in the Steel City. Devils goals to Zach Parise (9),David Clarkson (6 Empty Net),Nicklas Bergfors (5) and Andy Greene (3 Power Play). 1) The win over Pittsburgh was the Devils seventh in a row and their ninth road win in a row to start the season. A road win on Monday night over the Flyers would tie the record for most road wins to start a season held by the 2006-07 Buffalo Sabres. 3) On to last night's game and the Devils had quite a few standouts and three of them dominated the scoring as Nicklas Bergfors and Zach Parise each scored a goal and added two assists,while Travis Zajac earned three assists on the evening.The three played together most of the evening and were not only the best Devils line,but the best line from both teams on this night. 4) But for the numbers that Nicklas Bergfors put up,Jacques Lemaire was unimpressed as he pulled the Swede from the line and used David Clarkson in the slot in the third period. Apparently the the Devil bench boss was far from thrilled with his rookies play defensively,although I didn't see any glaring issues during the game. 5) Andy Greene continues his excellent play,but here is a stat that put Greene into the Devils history books. Greene is the first player in Devils’ history to score the game-winning goal or get an assist on the game-winner in each of five consecutive team games. And from a defenseman no less! Nice all around game by Bryce Salvador,who blocked shots,harassed Penguins and was solid in a non scoresheet way. Had to watch the Penguin feed since the game was on the NHL Network. Paul Steigerwald and Bob Errey aren't nearly as bad as Washington's Beninati/Laughlin pairing,but listening to them whine about the Penguin injury issues all night,when the Devils are similarly battered grew tiresome. I do like watching games at the soon to be gone Igloo though. The injury plagued New Jersey Devils kept on rolling with a 3-1 home win over the Anaheim Ducks. 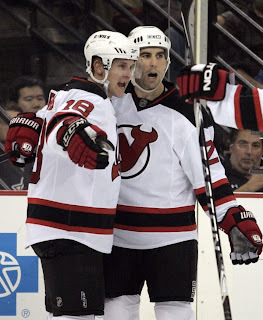 The Devils goals went to Jamie Langenbrunner in the first,while David Clarkson (5) and Zach Parise (8 Shorthanded) added theirs in period 2. The victory lifts the Devils to first place in the Atlantic Division with Pittsburgh,although the Penguins have played two more games than New Jersey. 1) Nice job by the defense in this game. 2) Two assists for Andy Greene,who seems to be turning the corner as a passer/puck mover. Greene has positioned himself as the top beneficiary of the injuries to Paul Martin and Johnny Oduya with his play thus far this season. 3) What a move on the David Clarkson goal by the right winger with the toe drag around James Wisnewski and then whipping the puck by Jonas Hiller. Now that is the type of progress that I hoped to see from Clarkson,who is seeing time on both the power play and penalty kill units. 4) Six wins in a row for the Devils despite all the injuries and the team has allowed just seven goals in that span. This run has been amazing all things considered. 5) The backbreaker for the Ducks was the Zach Parise shorthanded goal late in the second. Jonas Hiller made the initial stop,but couldn't stop Parise from slamming the h ome through by the post on the followup. The goal was the first ever for Parise shorthanded and that is because he was seldomly used on the PK in the past. Jacques LeMaire is giving Parise time on the kill and when your faster players are on the ice,one has a better chance on shorthanded opportunities. Nice event before the game as the Devils honored the 2003 championship team and brought back some of the retired players for the evening. Turner Stevenson,Grant Marshall,Ken Daneyko and Bob Carpenter were all in attendance. The Ohio State Buckeyes stomped into Beaver Stadium,knowing that they needed a win over Penn State to keep their Big Ten title hopes alive and controlling their own fate in the process. The Buckeyes were the underdog,but controlled the game and silenced the Penn State crowd with a 24-7 win and set up a winner takes the title and Rose Bowl bid showdown on Saturday with Iowa. 1) The Penn State crowd came for revenge against Terrelle Pryor for sp urning the Nittanys in favor of OSU,but the jam packed stadium seemed to inspire Pryor more than intimidate him. Pryor tossed two TD's ( 62 and 6 yards respectively) and rushed for another,but I thought the biggest part of Pryor's afternoon was avoiding the big mistake that he seemed to make so often in tight games. Pryor kept himself poised and most importantly,took what the Penn State defense gave him and didn't force the action. 2) Pryor's best play was the long TD pass to the wide open Devier Posey on a go pattern in the third quarter that pretty much broke the spirit of the Penn State defense. The throw was on the $ and was type of throw that Pryor has misfired on in the past,but he could have had another as he overthrew Dane Sanzenbacher,who had gotten behind the Penn State corner in the fourth quarter on what would have been a sure score. 3) Give some credit to Posey as well for not letting up and making sure he was in the end zone before slowing up. All too often players slow up too soon and wind up being tackled before scoring or allowing the defender to get close enough for a free shot and then cause an injury. 4) Ray Small has had a checkered career in his term as a Buckeye,but his two punt returns set up two scores with field position and showed the type of explosiveness that could get him an NFL shot as a return specialist. Small has always had the speed and skills to make a difference,but the attitude was the question. 5) I didn't think that Penn State should have even scored at all as Daryll Clark was stopped short of the goal line on his fourth down rushing TD. The review didn't show inconclusive evidence either way,but I thought he was short. The "breaking the plane" rule is perhaps my most hated in football. 6) Perhaps it is time to look at the rule and go back to the original intent back in the games origins. 8) I have never seen a Penn State crowd empty out so quickly than they did on this night after Ross Homan's pick of Clark with over nine minutes to go. 9) Between Brandon Saine,Boom Herron and Pryor,Ohio State ran for over 200 yards against the Lions and enabled the Buckeyes to make Penn State respect the run and that opened the field for the occasional downfield pass from Pryor. That stat alone might be the quietest,but most important stat in the win. I also loved the leap into the end zone by Saine to score the Buckeyes final touchdown. 10) One final tip of the cap to Cameron Heyward. Heyward destroyed the Penn State line with two sacks and 11 tackles. A great stat line for Ironhead Jr and those are the type of numbers that I'll take anytime from any defender! 11) Don't take anything for granted,but Iowa is going into Columbus off their first loss and without starting QB Ricky Stanzi. The game looks good on paper for the Bucks,but Kirk Ferentz is an excellent coach for Iowa and he might have some things ready to spring on the Buckeyes. Just a short post off the Devils news wire. The Devils won all three games with me on hiatus,winning games against Washington,the Islanders and Ottawa for a six point sweep. As I didn't see any of those games,I will refrain from comments and focus on the news that I have missed..
Patrik Elias returned to action after missing the seasons start,so the De vils improved on offense. Matt Halischuk was brought back to the team after a one day trip to Lowell and brought veteran Dean McAmmond with him. Sestito was called up from Lowell as well. These moves were needed because Johnny Oduya and Rob Niedermeyer were added to the injured list. The loss of Oduya is a damaging blow to the Red and Black with Paul Martin already on the IR and Niedermayer joins Jay Pandolfo as two of the top penalty killers on the sidelines. The Devils attempted to slide veteran Jay Leach through waivers to add to the defensive depth with the injuries,but Leach was claimed by Montreal. Leach isn't a huge loss,but the claim leaves Lowell shorthanded on veteran defenders and that could eventually impact the Devils in a pinch. And what is with Montreal going after every Devil lately??? The Devils host Anaheim tonight and we will be here with normal coverage. Time for a few things that make me laugh. Battlin Bob rarely fails to make me laugh,but one thing that he does that just tickles the hell out of me is his unerring knack of being unable to follow the ball off the bat at a game. Here's to the Battler,the funniest guy I know-even when he isn't trying!! I have fallen in love with the Canadian television show Corner Gas recently after stumbling upon it late night on WGN. One of the best shows that I have seen in recent years and each character is easy to like in their own way,but my favorites are the cranky father Oscar and Karen the cop. This show is not cheap on DVD or easy to find in the US (I had to buy my sets from Canada),but well worth the time to find it. Take a look on YouTube and you can try some Corner Gas for free. Want another story that never fails to make me smile? Spending time years ago playing the old Statis Pro Football board game with a friend (Ernie,for those of that live here) and Ryan using the 1983 players. It is a smile of frustration though as a few players had tremendous hard to stop cards because their playing time was limited and they did well in that time. But Ernie's main player was an obscure Jet running back named Bruce Harper,who gained more yardage on his card than anyone and his worst run was a one yard gain. Believe or not Bruce Harper was better than Eric Dickerson in that game,if you didn't care about the game being realistic,which Ernie didn't! Sometimes I'll hear this voice screaming "HANDOFF TO BRUCE HARPER'! and makes me want to find the old game,pull it out and start playing. 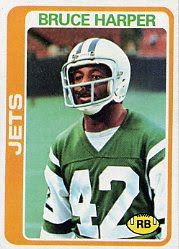 I would love to find a USFL set for SPF,that would get me back into playing quickly! Finally a note that makes me laugh and but with bitterness as well. In one of my coaching rebuilding jobs,I had a player with some talent that was in the group that wasn't going to be around to see the fruits of the rebuilding effort (too old),but this player simply refused to slide,flat out refused. The real reason is that his slides sucked,but moving on. In our last game of the season in a rainy night,Jack Mesner rounded third with the potential winning run,I'm coaching third waving him around and as I do,I slip on the ground right onto my face and watch Jack not slide and therefore tagged out on a high throw. Slide and safe by a mile,we lose in extra innings. I should be home later today,so get ready for some vacation stories and other catch ups over the next few days! For your autograph readers out there,here is some more catching up as I am on vacation. We last left off with the Augusta Greenjackets in town. The Greenjackets are the SAL affiliate of the Giants,who I have taken more of an interest in the last season. Pitching coach Steve Kline was one of the nicest guys that I have met as he chatted about his time with the Indians and some less than flattering comments about his time in Baltimore. Kline signed everything that everyone had and I couldn't say more positive things than I can about Steve Kline. Notable prospects added were former number one pick Wendell Fairley,shortstop Ehire Adrianza and pitchers Ryan Verdugo (who might have been the hardest thrower I saw this season) and Eric Surkamp along with outfielder Francisco Peguero,who impressed despite having little publicity going into the series. I had very little for the Lakewood Blue Claws as their set was out earlier in the season,but I did have a lot for catcher Travis D'Arnaud for myself and others and D'arnaud didn't like to sign before the game,but was very accommodating afterwards. Just a note for Phillies fans. The Delmarva Shorebirds were next in town and I was finally able to get Shorebird hitting coach Ryan Minor on one of his Oklahoma basketball cards. I had wanted Minor on one of those for a while and was finally able to find one.Minor was excellent as usual. Prospects LJ Hoes had been less than great on his first visits,but was terrific on this one.Xavier Avery was good on the first few,but not so good this time. Maybe it was the end of a long season and sometimes everything isn't always clicking. Most of the other top Shorebird prospects had been promoted,so that really summed up their trip. The final team in was the Lake County Captains in their final series as members of the South Atlantic League before their move to the Midwest League. The Captains are always one of the first teams to release their team set,so most of their stuff was from other team sets,such as Bo Greenwell,son of former Red Sox Mike Greenwell signing his Mahoning Valley and Trey Haley signing a Razor card. The best part of the series was teasing with Captains skipper (nautical pun intended) Aaron Holbert on how much he would miss the Muni. Holbert joked that a future condition of his employment would be that he would refuse to manage a team that visited Hagerstown! Finally,a few more kudos to my helpers. Jason Christensen helped me clean up on my Altoona Curve set and Jason,with the news of the Pirates heading South with the High A team set,that help may get larger! Tom O'brien helped me with a few players in Bowie that I hadn't gotten in Frederick and some huge help with the Akron Aeros. Tom was able to nab me my first and only Lonnie Chisenhall of the season along with Eric Berger's Carolina League All Star card. Berger was very nice in his visit to Frederick,but I got that card after that series. Tom also got former slugger Boog Powell on two cards as well. I would be remiss if I didn't mention my unnamed friend for all his help in Frederick with various cards that I missed through the season. His help is as always appreciated!!!! The Browns are on their bye week and likely will be under able to cover the spread (sad joke there). Ohio State travels to Happy Valley for their toughest road game of the season against a raging crowd against Penn State. Terrelle Pryor spurned the Nittany Lions for OSU and the fans there haven't forgotten. The Lions and their fans will be ready. Ohio State will have get more offense than they have getting,but watching the Penn State win over Northwestern they sure looked vulnerable. The Seahawks appear to be in mid-fade of a disappointing season that tells me that a re build is around the corner.However they are traveling to Detroit where the Rams won their first game all season last week. Seattle should be able to throw the ball well against the Lions and I don't see the Lions don't much against the Hawk defense. This weeks games of the week follow up on two wins in the first week. The College game features number nine LSU visiting the third ranked Alabama Crimson Tide. From what I hear,LSU is the only team besides Florida that controls their own destiny for the National title game. If LSU wins out.they are in. Not bad for a team that has already lost a game. Alabama will feed Mark Ingram the ball often and whether the Bayou Benglas can stop could be the difference. Nick Saban's team hasn't been challenged yet this season,LSU will do just that and it should be a good one. The Pro game has some interesting games,but we will go for the second week in a row with the Monday game as Pittsburgh visits Denver. Denver could have been exposed last week in Baltimore and the Steelers go into this one off their bye week. To the world of the fisticuffs as the two best light heavyweights in the world battle with no belt on the line. Chad Dawson and Glen Johnson fight a rematch of their bout last year that went to Dawson by decision,but many observers (me included) thought Johnson won. It goes to show the silliness of the sanctioning bodies that Dawson has won and dropped two of the three world titles in the last year without losing a fight. Give credit to HBO for putting the pressure on Dawson to fight a rematch that fans wanted to see,but Dawson really didnt want to make. The first fight was a good one,this one could be better. Johnson will try to get inside and pound the lanky Dawson to the body,while Dawson wants distance and needs to box more. This is Saturday night on HBO. The WBA Heavyweight belt is on the line as seven foot Nikolai Valuev de fends against the former undisputed Cruiserweight king David Haye. Haye has done a lot talking towards Valuev and the Klitschko brothers (holders of the other two belts) but has only fought once as a heavyweight. Valuev is not exactly skilled on the overall,but his size could wear down the far smaller Haye. If you really care about heavyweights,root for Haye as a Haye victory could add a lot of spice to the division,but watch for a lot of mauling by Valuev on the inside. The bout is on PPV live from Germany. I had made selections for both fights,but in my rush to get these ready,forgot to post them.